Reclaimed wood, making big things out of big wood. Thank you. I made an entry table a few years ago with the same tenon style, but it was all ebonized and thus more subtle. I took it to a different level in this piece. I do like how this came out, but not sure I would do it again. Started this project back in the Fall, then got run out of my garage by the cold. Then I moved. Now I'm finally settled into my new studio workspace - love it. So, back at it. I really love this old sugar pine lumber, such amazing figure and grain. 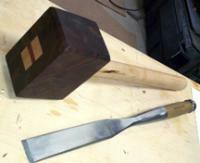 Been experimenting with exposed, loose-tenon joinery (as others have) (it's amazingly sturdy). I did it with another project a couple of years ago and really liked the effect. I still need to make the shelf, top, drawers, and doors. What do you think? you could probably tell them not send you the print version and just read it on a screen. Interesting idea, but I'm not sure if there are enough gyms within 200 miles to warrant that strategy, and I wouldn't even know how to monitor for such a thing. Yes, i'd really rather not cover the floor, but seems prudent. I may just do under and around the bench. Not sure yet, I'll have to spend some time in there before I settle on just where things will go permanently. Thanks for all the suggestions folks - I think I've got a good idea of what I should do. FYI...FWW has a new membership option for $99/year you get access to everything, yes EVERYTHING they have. you'll get the zine sub, all video workshops, past magazines (every issue published), projects and plans, books (all their illustrated guide books too) etc... it's a bargain if you ask me. They have a 14 day trial option. If you are about to veneer I recommend checking out the video series I just linked. There's plenty more on the subject as well. Agreed, hardware on a piece like this is likely a significant design consideration. The first sideboard, IMHO, would look better if they just used one pull per drawer. Oh, check this out https://www.finewoodworking.com/2015/06/05/use-mirrors-to-design-veneer-patterns you might be able to create 4 nice book-and-butts out of that crotch for your fronts. BTW, they accepted my offer. We open escrow tomorrow. This is gonna be a nice shop space. I feel all giddy. I'll be able to work in the winter too and not have to worry so much about humidity messing with my projects! Looks promising. How's the off gassing? I'm kind of sensitive to smells. I can't even go into a tire store, or Walmart for too long before I get nauseous. Hello, I'm likely moving into a new space soon. It will create a split shop situation for me. Machines in the garage, and hand tools and work bench in the studio. I mostly use hand tools, so this is ideal for me. I might bring the band saw into the studio as well - so I don't get lonely. Anyway, the studio has nice, fairly new oak flooring that I want to protect. I'll use some cushy mats throughout, but I'm thinking I should probably have a thinner, sturdier rubber like layer between the bench and floor (let's call it the sub-mat) to prevent skidding, and sliding of the bench. I would not want the sub-mat to stick excessively, or embed itself into the oak flooring (my bench is heavy, and receives a lot of shear force). Any ideas for such a product? Here's a picture of the studio, so you can share in my excitement. Hi Tom, Sorry to hear. If you're willing I might be interested in the drill press. If so, what's the model and year, and of course price tag? Hello! It's been a while. My shop has been on mothballs for a couple of years. I'm finally starting to get setup again. Just gonna center it around hand tools and a couple machines. This is not really a full journal, but I didn't see where else to put it. Let me know if it should be moved to a different category. To get going again I made a G&G influenced TV table, thingy. It holds the coffee cup, a book, sometimes a computer and the occasional plate of food. It's made from reclaimed mahogany (i think). All hand tools, except a few cuts on the bandsaw. I like how it turned out.